With added luxury exterior and interior elements, the 2019 QX80 LIMITED was designed to make a statement. Scroll down to read a quick breakdown about its many exciting features. The QX80 LIMITED comes equipped with a powerful 5.6-Litre V8 Engine, cranking out an amazing 400-Horsepower, and comes paired with a 7-Speed Automatic Transmission, with Hydraulic Body Motion Control! Incredibly, this QX80 also adapts for better traction by offering the Infiniti All-Mode 4WD, which monitors Torque, automatically adjusting it for a firmer grip on slippery or snowy roads. When you feel like making the choice yourself, simply select the 4H and 4L drive modes, which will let you hone traction at the turn of a dial. The QX80 LIMITED also comes with an amazing Suite of Infiniti Driver Assist Technologies including: Predictive Forward Collision Warning, Forward Emergency Braking with Pedestrian Detection, Back-Up Collision Intervention, an Adaptive Front Lighting System with Auto Levelling Headlights, Front Pre-Crash Seatbelts, Blind Spot Warning with Blind Spot Intervention, Distance Control Assist, Lane Departure Warning with Lane Departure Prevention, a Tire Pressure Monitoring System with Tire Inflation Indicator, Vehicle Dynamic Control, an Intelligent Around View Monitor with Moving Object Detection, and Intelligent Brake Assist. Offering striking curb appeal, the QX80 LIMITED will be sure to turn heads with its unique Bumper Finish, Striking Accents and LIMITED Badging on the Rear Hatch. 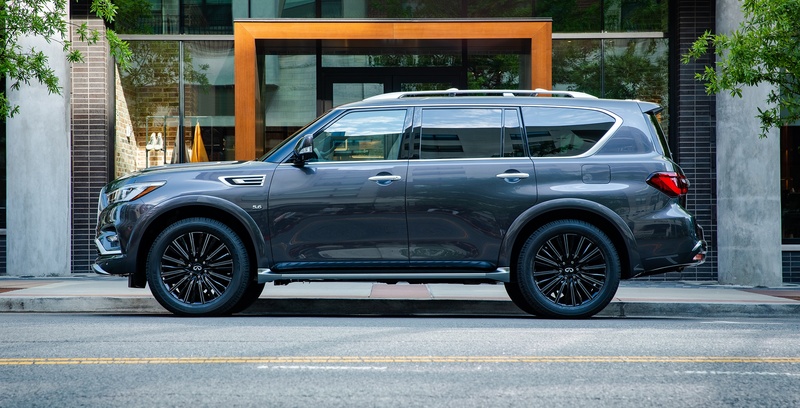 Plus, with Dark Machine-Finished 22-Inch Wheels, Satin Chrome Trim Lines with Matching Roof Rails and Cross Rails, this QX80 makes its presence known. On the inside, you will find an upscale interior with seating for seven filled with unique design elements. Among them are Semi-Aniline Leather and Alcantara Two-Tone Seats, which feature Special Quilting, Contrast Piping, and Embossed LIMITED Lettering, which blends beautifully with the Black Ultrasuede Headliner and Pillars. 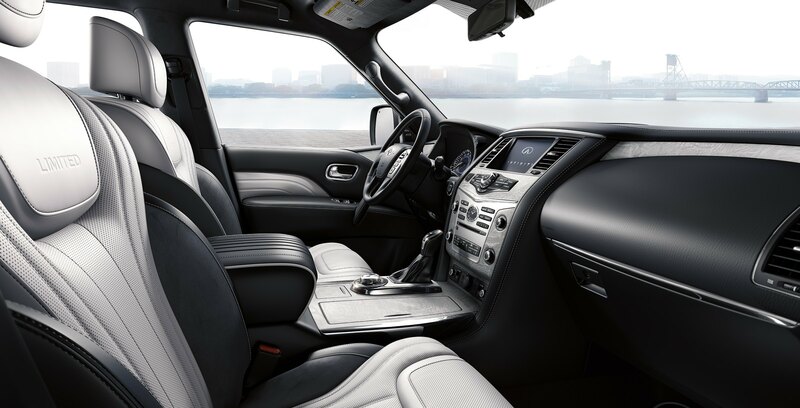 With advanced cabin technology and functionality that mirrors your smartphone, the 2019 Infiniti QX80 LIMITED keeps you connected to your Conversations, Navigation and Entertainment through the Infiniti Intouch Infotainment System, including an 8-Inch Touchscreen! To interact, just tap, swipe, pinch in or zoom out. Plus, the Infiniti Controller, which is located on the center console, allows you to control and adjust various features such as Audio, Air Conditioning, Heating, and Navigation. This QX80 LIMITED will be sure to keep all passengers entertained while they listen to music through the 15-Speaker Bose Cabin Surround System, with Digital 5.1 Decoding and Bose CenterPoint, including 2 Signal Processing. You can also tune into AM/FM Radio, play CDs, DVDs and MP3s! Incredibly, this QX80 also offers a Rear Entertainment System, with Dual 8-Inch Screens, including a Remote Control, two pairs of Wireless Headphones and AUX Inputs. 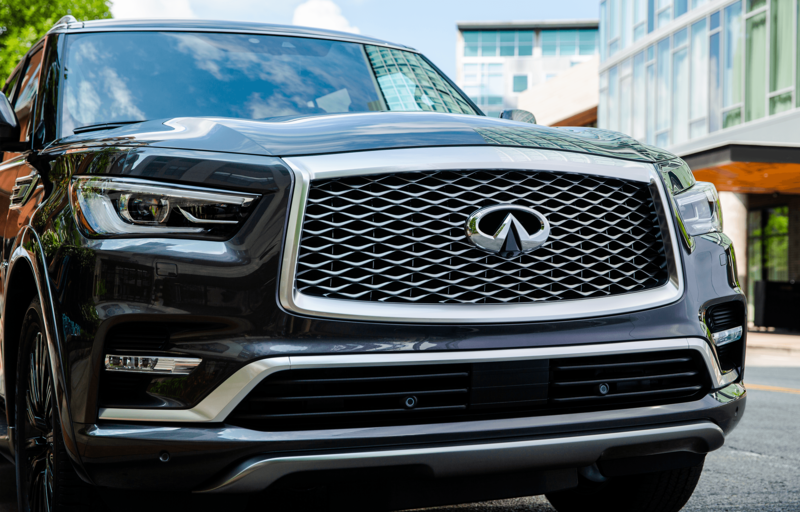 If you would like more information on the 2019 Infiniti QX80 LIMITED or if you are interested in taking it out for a test drive, then please contact us at Guelph Infiniti. We will be happy to assist you!